I'm sure most of you have heard tons of hype about several new drugstore products that have launched recently. In addition to Revlon's Lip Butters and L'Oreal's Infallible eyeshadows, Maybelline has also come out with a new cream shadow product that had me literally going to 4 different stops around town to find! The black furry thing is my dog, Cherry. :) You can see more of her in my Bday vlog here. And here are swatches. You can see the silver glitters in Eternal Black. 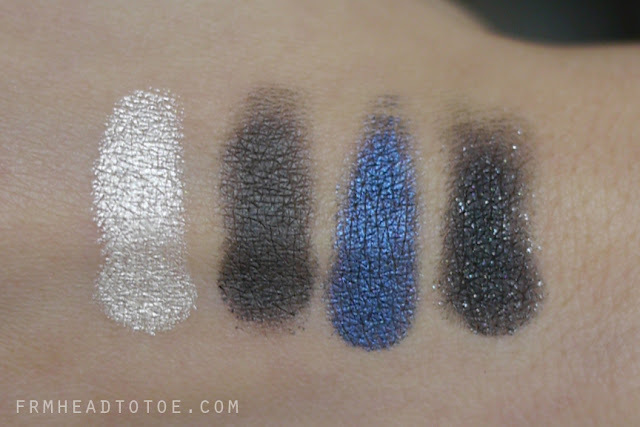 Midnight Blue and Iced Latte both have a pretty metallic sheen to them while Continuous Cocoa is more of a satin-matte finish. 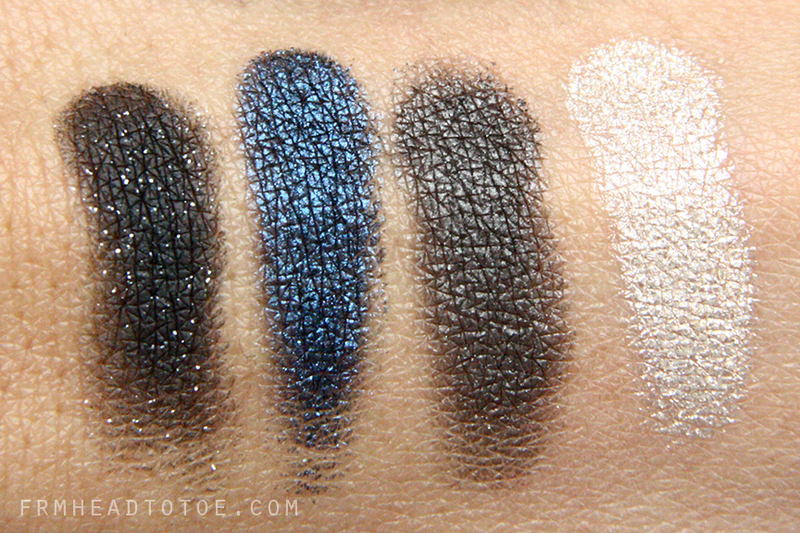 All are incredibly pigmented and long-lasting. Here's an alternative swatch image screencapped from my video footage. You can see how Iced Latte has a gold tint to it which is why I love it so much! The next item I wanted to highlight are the Maybelline Color Tattoo Eyeshadows which are a long-wearing cream shadow similar to MAC Paint Pots. 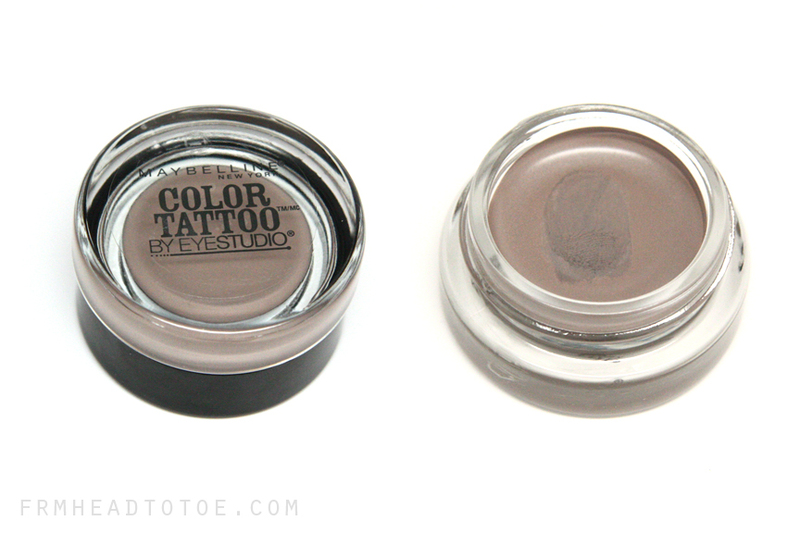 Tough as Taupe is a beautiful matte mushroom grey with slight purple undertones. 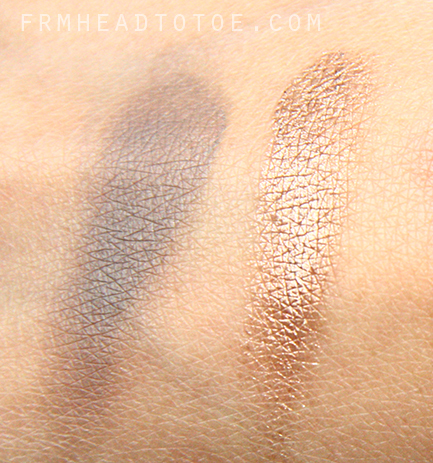 Bold to the Bronze is a medium bronze that is slightly cooler than it looks in the pan. I could see this looking nice on both warm and cooler skintones. Here are my swatchs for the 2 colors I picked up. I only got the 2 most neutral shades because those are the ones I thought I would love the most, but they also do come in several more brighter colors including orange, turquoise, purple, and burgundy. I have worn these for the last couple of days (ever since I bought them) and they have been stellar in terms of wear. They do dry pretty quickly so I actually prefer using my fingers for application versus a brush to get maximum smudging control. When I swatched my hand yesterday, these didn't come off until I used cleansing oil to remove them at the end of the day! This is something to note for those of you who tend to have issues with, say, NYX Jumbo eye pencils creasing. You'll probably need a waterproof makeup remover to get these off at the end of the night but they last throughout the day which is precisely why I LOVE them! I want to test some of the other items in my haul out more before I give them a full review but I'll try to put them up here on the blog soon! i actually just picked up the iced latte shadow. omg, its amazing. love it. PAINT POT DUPE!?!? Soo excited!!! 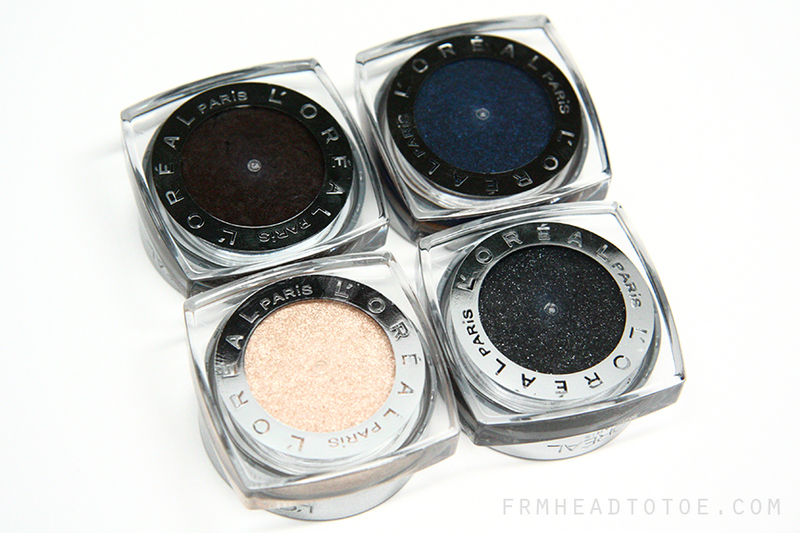 I'm also amazed at how pigmented the L'OREAL eye shadows are. I've heard much the buzz over these drug store buys. I really want to get my hands on that Maybelline shadow. "Midnight Blue" looks so pretty. I just bought Bad to the Bronze and I love it! The color is so gorgeous! I bought the Iced Latte and Amber Rush which is gorgeous. I wore these on my 12 hours shift and they did not budge at all! I also snagged the Maybelline blush in orchid hush. It's one of the lighter colors and looks sort of mauve and although I love the feel of it, it doesn't really show up on my skin. Maybe I just need to get a darker shade? I have the iced latte and I love it! I was kind of afraid of the brighter/darker colors because I wasn't sure how to use them but I love the idea of using them as liners. Will you do a tutorial soon showing us what type of brush you are using to apply them? Jen, I meant to tell you this a while ago but I kept forgetting - I picked up the Loreal HIP shadow in Electrified after seeing your review and I luvvv it. I used it every single day for 2 weeks. I might have to try some of the products you mentioned in this post. I just started visiting your blog and what a great blog! Very good product reviews, make me want to run out and grab some to try! ah! i have been looking for the color tattoo in tough as taupe. cant seem to find it. aHave you ever tried the Wet n Wild Jumbo Juicy Lip Balms? They're extremely inexpensive and good for a light coverage with some moisturizing ability. I'd love to hear what you think of them! The only thing is they're scented. I love that there seems to be MORE hype about drugstore releases than high end recently! I still have yet to try any of the new products though, but I reallyyy want to try Iced Latte! I'm dying to try The Maybelline Color Tattoos! They aren't available here yet. On Temptalia's recommendation, I picked up Maybelline Tough as Taupe. I haven't opened it yet coz it looks too pretty to swatch! I was told it was similar to Painterly Pot but Tough is darker. I'm sure I'll still love it tho. The Maybelline eyeshadows look great! Love hearing about these products! Can you make a video for your look in this video? amber rush I was like I HAVE TO GET THAT!! looks great, i wonder if they sell this in australia! I'm intrigued by the Loreal Infallible shadows...gonna have to try them soon! i just recently started following your blog, as well as your youtube channel. i'm obsessed! haha. keep them coming, i'm sure sponsorships will be headed your way before long! BEST INFORMATION ABOUT PURPLE MAKEUP. 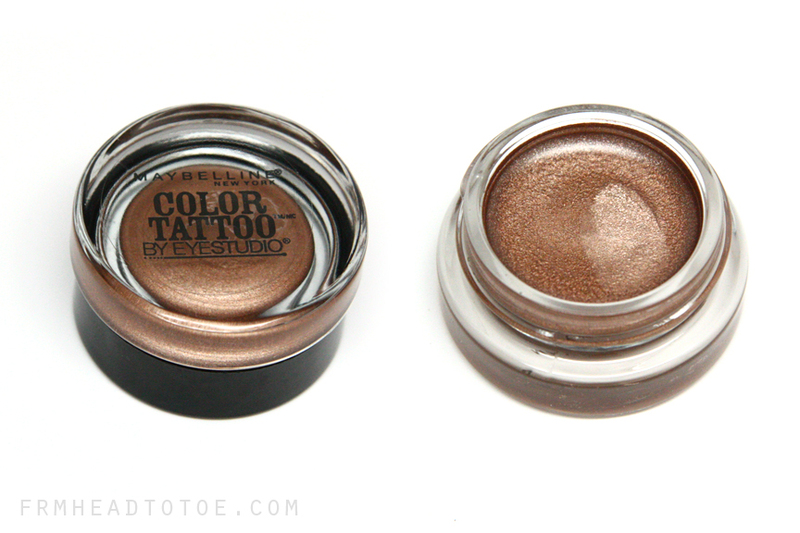 can you do a tutorial with the color tattoo tough as taupe? also, what moisturizer do you use? How would you compare the L'Oreal Infaillible shadows and the Maybelline ones? love your lip color you are wearing in video! What is the brand and color? Thx! !